Published today by Haus, an Armchair Traveller’s History of Tokyo. 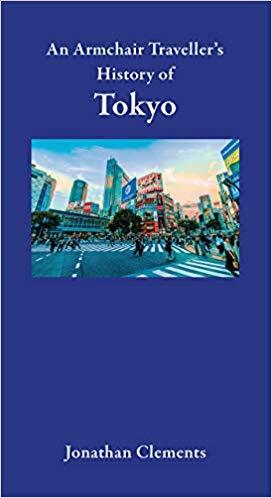 An Armchair Traveller’s History of Tokyo presents the modern capital of Japan from the first forest clearances on the Kanto plain, through the wars and intrigues of the samurai era, up to the preparations for the 2020 Olympics. Repeatedly destroyed by fires, earthquakes and war, remnants of old-time Tokyo can still be found amid the modern city’s urban sprawl, where the sites of ancient temples and forgotten battles sit beside run-down boom-era boondoggles and modern malls. As with other Armchair Traveller guides, a Gazetteer offers detailed information on sites of tourist interest, including the hidden etymologies of familiar locations on the metro map, stripping away the modern streets to reveal stories behind the lost valleys, post stations, castles and gravesites. Jonathan Clements is the author of A Brief History of the Samurai, Anime: A History and biographies of Admiral Togo and Prince Saionji. His recent books include Modern Japan: All That Matters and Christ’s Samurai: The True Story of the Shimabara Rebellion.